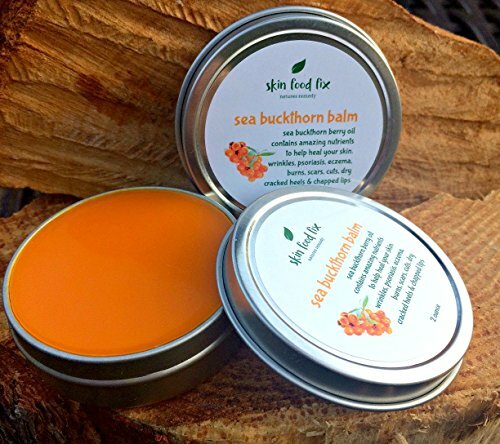 A 2 oz tin with Sea Buckthorn Vegan super hero organic plant oil extract with so many vitamins and nutrients in it for natural healing and rejuvenation that help skin recover from a wide variety of conditions. Has the hard to find Omega 7 ! Our skin LOVES omega oils. ----Psoriasis and eczema can be painful, and I have known many sufferers of these skin afflictions to find relief with this balm. Some use it as a way to relieve sunburn pain or take the sting and itch out of bug bites, stings. available in the 2 oz Ti (easyto unscrew open) AND a new Lip Balm (oval flat shape) roll up tube for lips or travel. If you have any questions about this product by Skin Food Fix, contact us by completing and submitting the form below. If you are looking for a specif part number, please include it with your message.